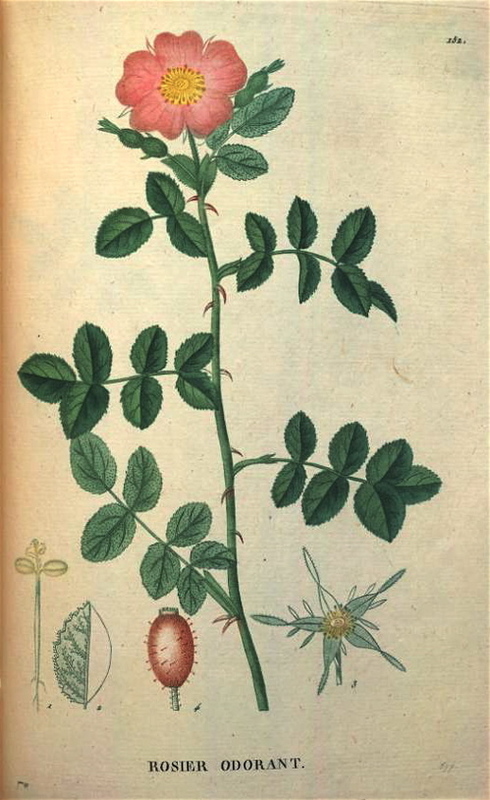 Hortus Camdenensis | Rosa rubiginosa L.
It forms a shrub growing to 2m or more, very branched, the leaves sweetly scented when bruised, the flowers single, usually solitary or 2 or 3 together, pale pink and cup-shaped, borne in summer. [FNSW, Paul (1848, 1888), Gore, Rivers (1854), Don, Willmot]. An ancient garden rose, there were many varieties in the early to mid 19th century with numerous synonyms. Saint-Hilaire Tr. pl.152/1825. Listed in the 1850 and 1857 catalogues [T.878/1850]. It is an important weed in parts of Australia including in the Camden district. More details about Rosa rubiginosa L.